Professional Temporary Tattoo 3 Airbrush Kit with G22, S68, E91 Airbrushes, Master Compressor TC-20, Air Hose, 100 Tattoo Stencils. Everything you need to get started doing temporary tattoos. MASTER G22 Gravity Feed Airbrush, MASTER G68 Siphon Feed Airbrush, MASTER E91 Siphon Feed Airbrush. Model TC-20 Maintenance Free Air Compressor with Automatic On/Off Shutoff, Air Regulator w/Gauge. Deluxe Book of 100 Reusable Temporary Tattoo Stencils (TAT-1). Tattoo Primary Paint Colors in 1 oz. Bottles: Black, Red & Blue. 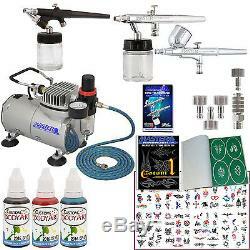 Professional Premium Temporary Tattoo Airbrushing System with 3 Multi-Purpose Master Airbrushes. Airbrush Models: G22 Gravity Feed, S68 Siphon Feed, E91 Siphon Feed and the TC-20 Professional Air Compressorr. And the 3 Most Popular Custom Body Art Airbrush Tattoo Colors plus a Temporary Tattoo Stencil Booklet with 100 Different Stencil Designs. Includes Master's How-To-Airbrush Manual. Versatile system is ideal for multiple uses. Hobbies, crafts, fine art, nail art, temporary tattoos, cake decorating, sunless tanning, cosmetics, auto-motorcycle graphics & more! Master Airbrush Model G22 Airbrush Set. Master performance multi-purpose high performance dual-action airbrush with a 1/3 oz. Gravity fluid cup and a 0.3mm needle & nozzle that allows you to spray from hairline up to 1-1/2 wide patterns. Master Airbrush Model S68 Airbrush Set. Master performance multi-purpose precision dual-action siphon feed airbrush with a 0.35 mm needle/nozzle, 3/4 oz. Fluid bottle and a 1/6 oz. Color cup that allows you to spray from fineline up to 2 wide patterns. Master Airbrush Model E91 Airbrush Set. Single-action external mix siphon feed airbrush set with a 0.8mm tip, 2 - 3/4 oz. Siphon bottles and has an 1/8 air inlet (airbrush can be used with a compressor or with the included hose & adaptor for a propellant can). Master Airbrush Air Compressor Model TC-20. Professional high performance single-piston airbrush air compressor with air pressure regulator with gauge & water trap filter. 3 Color Custom Body Art Temporary Tattoo Paint Kit in 1 Ounce Bottles. The 3 most popular colors black, red and blue. Custom Body Art Self-Adhesive Reusable Temporary Tattoo Stencils Booklet #1 with 100 Different Stencil Designs. (Poster for Display Purposes Only and is NOT included). Booklet #1 Contains 25 Pages with 4 Unique Tattoo Stencil Design Patterns on Each Page. Design sizes range from about 2" x 2" to 2.5" x 4". Designs Include: Animals: Butterflies, Bees, Spiders, Scorpions, Birds, Dolphins, Eagles, Turtles; People & Objects: Tribals, Skulls, Devils, Hearts, Rose, Flowers, Dragons. 6 Foot Braided Air Hose with 1/8 Fittings. Airbrush Quick Disconnect Coupler with 3 Plugs. 1/8 bsp female thread connections. Compressor mounted airbrush holder that holds 2 airbrushes. How-To-Airbrush Manual & Guide Booklet. San Diego, California South Carolina. The item "3 AIRBRUSH TEMPORARY TATTOO SYSTEM Air Compressor Kit Body Art Paint Set Stencil" is in sale since Monday, December 09, 2013. This item is in the category "Crafts\Art Supplies\Painting Supplies\Airbrushing Supplies\Systems & Sets". The seller is "tcpglobal" and is located in Duncan, South Carolina. This item can be shipped to United States.